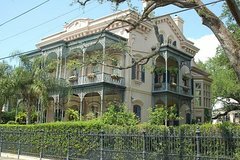 Visit the neighborhood known as the Garden District where the Americans settled after the Louisiana Purchase. See the variety of architectural styles such as, Greek Revival, Italianate, Queen Anne, while visiting the place where Jefferson Davis, president of the Confederacy, spent his last hours. Cast your eyes upon the home of our latest great contributor to the New Orleans' landscape, Sandra Bullock. The tour includes a visit to Lafayette Cemetery, which holds the remains of John Howard Ferguson, judge in the famed civil rights case, Plessy v. Ferguson. Judy's great-great grandfather, George Geddes, was a member of Comité des Citoyen, of the Plessy v. Ferguson case. Ba "joie de vivre" experience (joy of living)! Ba "joie de vivre" is present in all of her tours.